This year I took over our student leadership team. It has been so fun. It is also a whole different dynamic than leading the entire group as a whole or even leading my guys only small group. There has been somethings I have done with them in which I think have worked well and somethings I won’t do again but overall, this group of students is so fun to be around and pour into in different ways. 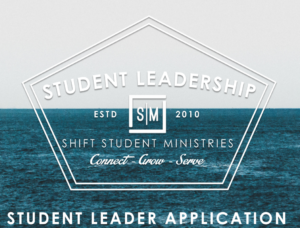 Consists of each student being nominated to join by our adult leaders and then fill out an application. You can see our app HERE. Right now, our leadership has 17 students ranging from a few different high schools. We meet every other Sunday night. It’s not for every student. Student leadership is reserved for students who are bought into our ministry and show some leadership skills. Students in our ministry are nominated to be in leadership and be a part of our ministry in a different more involved way. You can lead them differently than how you do a majority. I like this group because they are ones who are usually in a small group already and already have someone pouring into them so it frees me up to lead them in a different way. I try to lead them how I would lead our adult leaders. We go through different material have different conversations than they would have in their own small groups. We go through straight leadership classes and discussions. I pull out excerpts from books I have read, read and talk about them. We watch leadership videos, from Global Leadership Summit or Craig Groeshel Leadership Podcast and walk through some of those things as well. It’s amazing when you give students to step up to different conversations what comes out of them. Let them know things others don’t know yet. Last night we met and I gave them a 10,000 foot level view of our 2017 series and events calendar. Giving them a glimpse of what is to come they become so excited about it. These are some core students and when they get excited it spreads. They are IN! They tell friends, they bring more people. They can talk up any event or series for you because they know and they too are excited. Not only let them dream and plan, but actually use their ideas. We had a planning night with our student leadership where they brain stormed some ideas, series and events for their peers. Click HERE to have an idea of what that looked like. All of that is awesome, but if you come back and plan the year without taking any of their ideas it will just deflate them. What is the purpose of planning WITH them if you DON’T take anything to make it happen. Once they see their event or idea in the plans to actually see it’s going to happen, it shows that you really do care for what they have to say and they might actually know what their peers would actually like. Crazy right? Give them roles of leadership in front of their peers. Our students don’t only meet and plan for future things but I want them in leadership roles in front of their peers. On Wednesday nights we give our students some roles to participate and pull off service. They greet people as the walk up, I grab them to meet brand new students who are there alone, they pass out pens and bulletins for the teaching time, they distribute the communion elements and offering baskets, they are on trash duty in our worship center when a service is over and they do some announcements and things on stage. Do they have time to hang out and be with friends? Of course, but they do have roles to play. Have fun. Just because they are in leadership doesn’t mean it’s all business all the time. They are still students and students like to laugh and have fun. Our meetings might look different from all the other meetings I am involved with students, but fun is a universal language. In our meetings we have THE HOT SEAT, where each student will eventually sit and the group has 2 minutes to ask whatever questions they want to that student. We just had our Christmas party last night and had food, exchanged gifts and laughed a lot. It’s a good thing. So I am learning a lot leading this group of students. These are just a few random thoughts as I am processing through continuing to lead them this year. So fun! Good stuff Justin, I appreciate your insight and heart to reach well beyond your just your church and students. Thanks brother!